Reginald John Beard was Tony's Grandfather. My Grandfather moved to Dore and Tottley when he was 14, his father worked as an inspector on the railways. As they lived outside the city boundary he attended Dronfield Grammar. Aged 16 he left school and went to work for Hadfields in the steel laboratory. Hadfields were producing armaments- armour piercing shells etc. He worked in the steel analytics section. 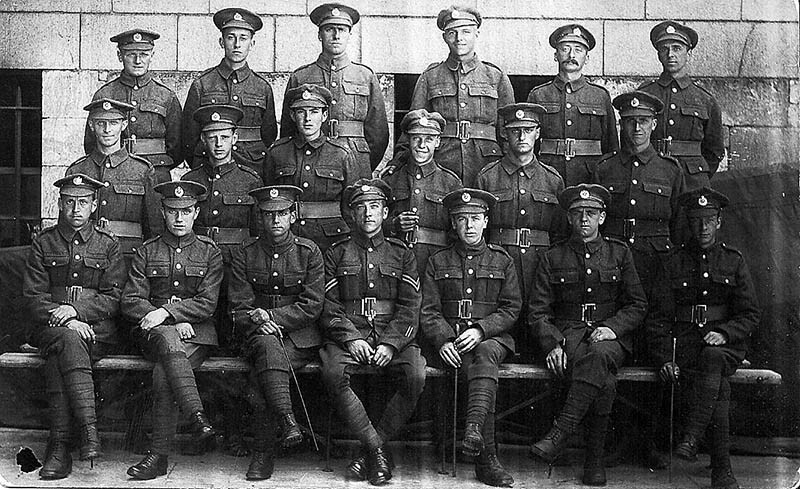 After the war Hadfields applied for him to be demobbed to return to work for them. In 1920 he was offered an apprenticeship with Brown Bayley. During the Depression he was made Foreman of the Rolling Mills. In 1927 he went into business with his brother-in-law opening a garage in Woodford, Cheshire. In 1945 he moved to Guernsey developing a flower and tomato growing/exporting business (he always had a love of gardening). In 1966 he emigrated to NZ with his wife, my mother and father, myself and my younger sister. He continued to work in NZ until he was in his 80's, finally having to give up as he suffered from Glaucoma. I will always remember with great love and affection my Grandfather. He was an amazing man, could turn his hand to most things, kind, with a great sense of humour. I remember one joke he told me as a teenager that he had first heard in 1918 in France ' what is the difference between and Italian sniper and a constipated Owl?' One shoots and can't hit, the other hoots but can't s**t' My grandfather enlisted in early 1918, initially sent to Devonport where he undertook 8 weeks basic training. He was sent to France and undertook further training in the use of gases and laying down smoke screens. He had joined up with his best friend - Harry Johnson - later captain of Sheffield Utd and played for England, also managing Mansfield Town. The pitch from the RE was that as they were involved in engineering (Hadfield Steel Works) joining the RE would be like an extension of their careers and would make it so much easier to assimilate back into civilian life at the end of hostilities. 'From the start of May 1918 the company was at Le Cornet Bourdois near Lillers attached to XI Corps, First Army (following on from it's involvement during the Battles of The Lys in April). On 14th June A, B and C Sections moved south to Rainneville and came under orders of III Corps and ANZAC Corps, Fourth Army. D Section at this time remained with XI Corps, supporting 5th Division during the action of La Becque on the 28th June; it re-joined the rest of the company on 30th June. Under the Fourth Army, during June and July A Section for the most part was attached to III Corps; B, C and later D Sections were attached to ANZAC Corps. My gradfather was lucky, never wounded, only injury was falling in a shell hole in no mans land under cover of darkness and knocking himself out. He was delayed in being demobbed and remained in Belgium till April 1919 helping supervise German POW's in rebuilding work- roads etc. He remembered that time as being very hard as there was a real lack of food and the locals did not appear very happy to have the troops remaining for an extended period of time. In WW2 he served in the home guard with a rank of Sergeant- his view was anyone with WW1 experience became an NCO or an officer! My grandfather at this time owned a garage in Stockport which backed on to the Avro factory, one of his best friends was the chief test pilot of Avro and as such took my Grandfather up on some of the early flights of the Lancaster. Reginald was born at Rodbur, Stroud, Gloucestershire on 18/5/1899. He was Sapper # 335151 of No.1 Special Mortar Company, Royal Engineers. Reginald died at Christchurch, New Zealand on 15/3/1995. Harry Johnson is thought to be standing behind him (See Text). 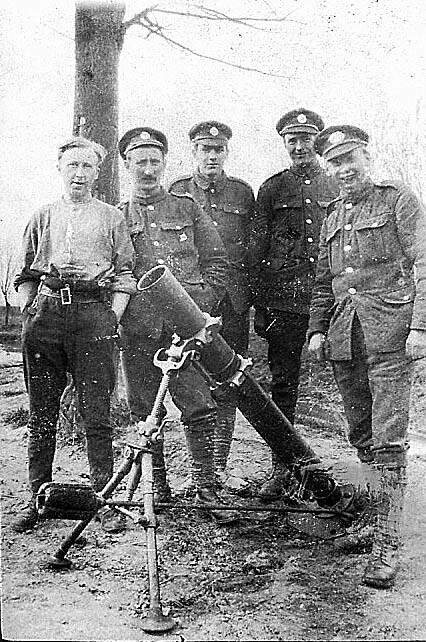 Stokes Trench Mortar in France in 1918.